If Chicago Public Schools can't come to an agreement with the Chicago Teachers Union by midnight, teachers will be on the picket line Tuesday morning. Both sides were back at the negotiating table Monday afternoon after a weekend of contract talks. This time, the Chicago Teachers Union had 40 or so members of its Big Bargaining Unit involved. They're a group of rank-and-file members that leadership has been using to take the pulse of the full membership on negotiations, sort of as a proxy. Mayor Rahm Emanuel on Monday said there's a generally positive working environment at the negotiating table to reach the shared goal between the district and teachers: to ensure teachers are able to be in the classroom Tuesday morning. But union members were making plenty of strike preparations Monday afternoon, in case an agreement is not reached. School delegates from across the city picked up strike signage and CTU apparel to distribute to colleagues on the picket line Tuesday. Because they're in negotiations, leadership has been keeping quiet. Even at a press conference last Friday, CTU President Karen Lewis didn't say much. The union has told members that unless they hear otherwise, to be ready to strike Tuesday morning at 6 a.m. We're not expected to hear anything from teachers until negotiations are done late Monday night, and we'll be updating our stories when we get official word. Some teachers say there's so much wrong, it may be difficult to fix in the 11th hour. Another teacher says he and his wife, who is also a CPS teacher, have been saving for months in case a strike happens. He explained that teachers are standing up for on the picket line for more than compensation. “Our students deserve so much more than they get,” said teacher Dave Stieber, who wrote an article on HuffingtonPost.com last week about the “necessity” of the strike. “They shouldn’t have to be in a school system that’s not guaranteed their funding every year. We shouldn’t have to be talking about the violence that they deal with that–yeah it doesn’t happen in this school–but as teachers, we help them work through that, we experience it with them. Another teacher who was picking up strike materials and declined being interviewed on camera said she's not in favor of this strike. She thinks teachers can stay in the classroom and continue educating their students while still negotiating for the contract they want. Chicago Public Schools says all schools will be open Tuesday for students, and they can report to any school–it doesn't have to be their own. The district only asks that elementary students go to elementary schools and high schoolers go to high schools. Parents can register their children at CPS's website. The Chicago Park District and Chicago Public Libraries are also providing sites for students Tuesday as well, in addition to Chicago State University other local organizations. 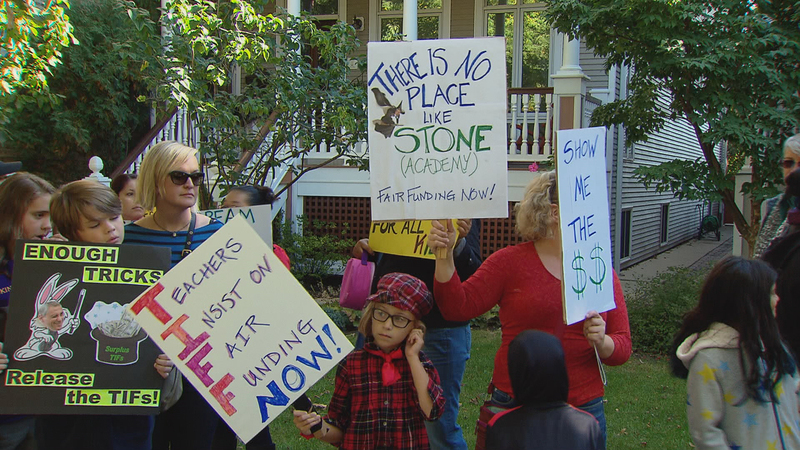 Monday morning a group called Parents 4 Teachers held a demonstration in Emanuel's Ravenswood neighborhood, calling on him to divert TIF funds to stabilize the district's funding. The parents say their students' schools have faced cut after cut, and even though they support their teachers, they believe the mayor has the power to keep a strike from happening. The group Parents 4 Teachers held a demonstration Monday morning in the Ravenswood neighborhood of Mayor Rahm Emanuel, calling on him to divert TIF funds to stabilize Chicago Public Schools funding. Late Monday, CTU shared the results of a poll conducted by Lake Research Partners. Of the 2,019 voters surveyed, 55 percent favor a strike if the mayor and CPS cannot reach a deal with the teachers union. Another 17 percent were undecided. The district has said repeatedly in the last few weeks that it believes a strike can be averted. Peter Cunningham, former assistant secretary of education under Arne Duncan who worked with Duncan when he was CEO of CPS, said he too believes a strike can be averted. Cunningham is now the executive director of Education Post, a nonprofit education advocacy organization. He said the district is in dire financial straights and the offer the district gave the teachers is a reasonable one, and a strike isn't necessary. Stay tuned for updates on this story. If teachers to walk out Tuesday, the picket lines begin at 6 a.m. We’re also told teachers will head to City Hall around 10 a.m. to protest the mayor's budget address. Oct. 3: Some Chicago Public Schools students may be missing their teachers as more than 250 layoff notices go out Monday.